In 2010, Canada committed to supporting its marine industry by building vessels locally to equip the Royal Canadian Navy and the Canadian Coast Guard. Through this commitment, named the National Shipbuilding Strategy, Canada has put in place a long-term plan of investing billions of dollars in the industry to equip itself with much-needed vessels to serve Canadians and protect its interests at home and abroad. Playing a significant part of this approach, not surprisingly, is technology. Building on the premise of technology in ships, Vanguard will be holding its sixth Ship Tech Forum on March 5, 2019, at the Shaw Centre in Ottawa. The Ship Tech Forum is a one-day conference highlighting emerging technologies, addressing challenges, and growth opportunities for the sector. “The Ship Tech Forum is designed to create a meaningful dialogue between industry, government and military to provide stakeholders with knowledge and share lessons learned from a technological perspective with the aim to showcase successful investments in cutting-edge technologies,” said Terri Pavelic, Editor-in-Chief of Vanguard. She went on to add that this forum is an opportunity to explore Canada’s excellence in technical shipbuilding, future technologies and the impact on economic growth and export. 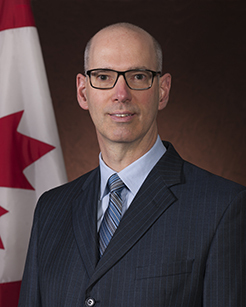 With over 35 years in the Canadian Armed Forces, Patrick Finn has developed the expertise in leadership and management in the domain of materiel readiness for operations and in complex project management. After serving in various ships and submarines, Pat worked in various acquisitions and modernization projects for the Royal Canadian Navy and subsequently provided oversight for projects in all branches of Canada’s military. To attend this event, go to https://vanguardcanada.com/shiptech2019 before December 31 to take advantage of the early bird rate. Seats are filling up quickly, reserve yours today.